Swimming, tennis, fitness center, yoga, social center for teens and birthday parties – this ad fits all the amenities into one ad without overpowering the reader. The Hasentree Family Activity center has a lot to offer, and we wanted to feature it all to give viewers the truest look into the facilities. 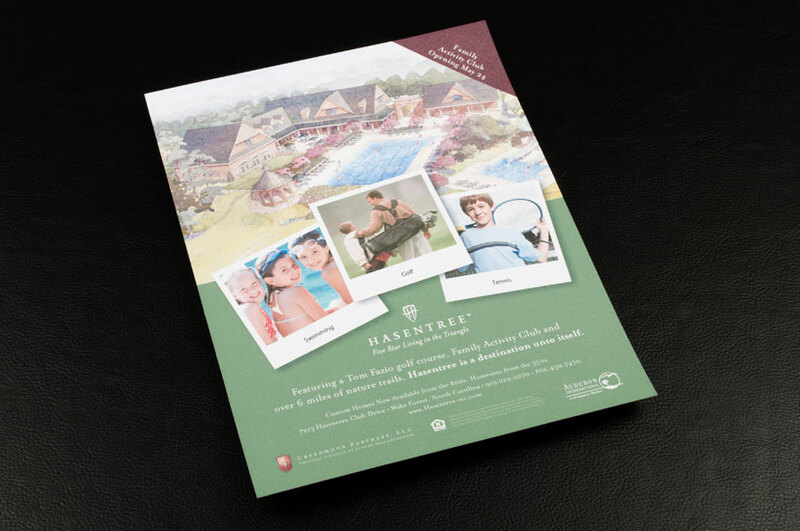 Professional photography is paired with illustrations of the facility from above, creating a storybook-feeling that is both personable and attractive to those considering joining the Hasentree community. Hasentree is a luxury resort-style neighborhood located in Wake Forest that caters to rest and relaxation. The peaceful shade of green we chose to incorporate in this design reflects the neighborhoods commitment to a peaceful community.